"Behold another sacrificial offering from the Lord: Spewing forth gruesomely grim, buzzing and blazing black metal, Southern Lord is proud to unleash the debut incarnate from Norway's Mord (which translates to: 'Murder' in their native Norwegian blasphemous tongue). This is pure yet filthy Norwegian Black Metal in the veins of ye olde guarde: Immortal, Dark Throne, and Carpathian Forest. 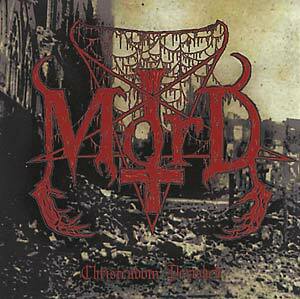 Mord effectively put a different spin on 'traditional black metal' by injecting the influence of satanic death metal bands like Incantation and Sadistik Exekution. As has come to be expected from the recent Black Metal outpouring coming from the Southern Lord lair, Mord is no exception to Southern Lord exclusively offering only the absolute purest, bleakest and blackest unholy Black Metal in existence."